There are few things in this world as delicious as farm-fresh produce. If you&apos;re in or near the Sandy/Draper area, heading to Farnsworth Farms is a must! Farnsworth Farms is located in Sandy at 11228 South 700 East. For over 50 years the farm has been owned and operated by the Farnsworth Family. Their specialties are apples and apple cider, though they offer a wide selection of all kinds of farm-fresh produce. What makes their apple cider so special? They hand-sort every apple that goes into their cider, making sure it&apos;s only made up of the absolute best apples. Their rule is: "if you wouldn&apos;t eat it, don&apos;t put it in our cider." In many commercial ciders there&apos;s not a good sorting process, meaning that sometimes rotten, bad or even moldy (yuck!!!) apples often get into the cider. Even though the cider is pasteurized, the flavor is still tainted. With Farnsworth Farms apple cider, however, you get superior taste and quality. In the fall Farnsworth Farms grows tomatoes, eggplant, watermelon, cantaloupe, honeydew melon, jalapeno peppers and Anaheim peppers. They allow the public to come and "pick-your-own" produce, right out of the field. 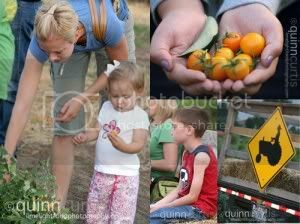 They love how this gives families the opportunity to show their kids where food really comes from (the farm, not the store). My kids had a blast visiting Farnsworth Farms. They got to see how the cider is made and even got a hay ride around the farm on the tractor. Then we all got to pick some yummy tomatoes right off of the vine. It was such a great family night out together. We were sure to bring home lots of fresh Farnsworth Farms apple cider (which was gone in a day!).... 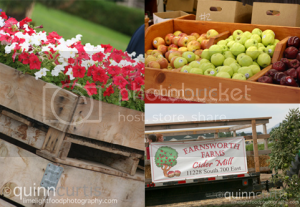 mmmmm... just thinking about it makes me want to run out to Farnsworth Farms right now for some cider!! Our family first experienced Farnsworth Farms with facebook.com/sassyscoops, a group a Utah bloggers who review and feature local businesses. After featuring Farnsworth Farms, our family became lifelong fans! Read more from Quinn Curtis at facebook.com/sassyscoops.